Home > Blogging > Is Wix Better Than WordPress For Ecommerce? If you use the internet too often and you are interested in blogging, ecommerce, or other online stuff, you’re probably familiar with Wix and WordPress. To break it down to you, WordPress and Wix are two of the leading website builders on the market. Without any doubt, WordPress is the most popular of the two because it has been around for over 15 years now. However, Wix is more of a newcomer in the field, but it has proven to be very reliable when it comes to building websites. But before anything, you should always ensure that you find the right website builder for your business. But out of the two (Wix and WordPress), which is the most reliable? Let’s explore that. If you look at the tips of finding the right website builder for your business, one of the things to consider is the price. The pricing and costs of the builder will determine if they will serve you as you expect or not. How much you are willing to spend on the developing and maintenance of your website will depend on your needs/preferences. A good website builder should let you do whatever you want within the available budget. So, how do Wix and WordPress compare in terms of the pricing and costs? Plus, you won’t get the essential add-ons like eCommerce or Google Analytics. However, you can upgrade your plan to enjoy more add-ons and remove the ads on the header and footer of your website. There is the Unlimited Plan that goes for $12.50 a month. However, the best choice if you want an eCommerce store is to go with the eCommerce plan that would cost you $16.50 per month. WP also offers a free plan with limited features. First off, you will need a domain name and web hosting before you can install it. The basic plan is available, but you can use it along with your web hosting provider. But a managed WordPress hosting provider like WP Engine will cost you $29 a month. But the cost of using WP comes when there’s the need for using the premium themes and plugins. 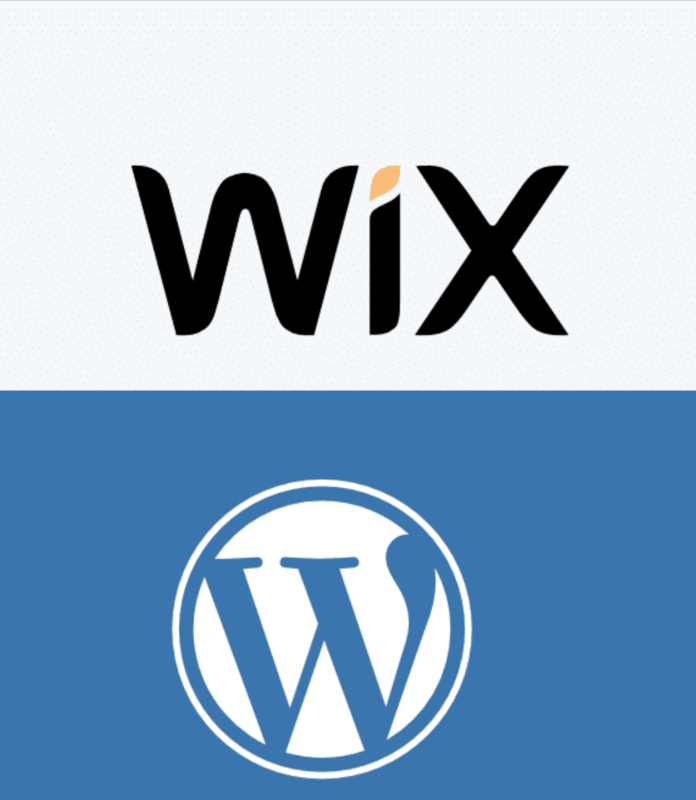 In terms of the cost, WordPress seems to be on the lower side than Wix. However, Wix also offers a free plan that lets you get the test of what you will experience once you purchase the premium package. But what gives Wix an upper hand is that they offer a specific package for the eCommerce clients. This way, you will be paying for what you need. Wix comes with a dedicated online store section that allows you to conduct your online store professionally. You also get to sell your products through different payment options. Nonetheless, Wix comes with limited tax and shipping options. But the best part is that the website builder also supports digital goods, which makes it extra beneficial to the ecommerce. Wix will display a list of products on a page, which also includes the product categories. The builder gives you full access to every relevant feature. WP on its own cannot help you build a professional online store. For that reason, you will need to have a third-party plugin. The most popular plugin for eCommerce is the WooCommerce plugin. With this plugin, you can be sure of having enough resources to let you do the best you can with your online store. Luckily, it has a free version that you can use to create your online store. But the premium plan offers a better experience in the payment gateways. Out of the two, Wix is best suited for those getting started with a small online store. It will serve you accordingly by giving you the needed resources and tools to set up a decent online store. You can check out the Wix reviews for ecommerce to help you understand it better. Conversely, WordPress is an amazing platform for the large online stores because it has plenty of features, thanks to the WooCommerce plugin. The user-friendliness of any platform is very vital. The interface of the platform must be easy to use without giving you a hard time. The fact that you want to choose between these two website builders is that you will get to create your online store without the need for a web designer. You can enjoy incredible tools that are easy to use when using Wix. With these tools, you can easily build up your online store with the drag-and-drop interface. Besides dropping items on your website as you create your website, you can also rearrange things on the page, add media, and more. No coding is needed to do this. With WP, you will enjoy the visual editor that will help you write content, customize themes, and even edit the theme properties. The drag and drop builder is not a default feature on WordPress. You will need to download a different plugin to help you build your online store accordingly. If compared, Wix takes the lead in terms of the user-friendliness. You will not need to have extra tools and plugins just to make an online store with Wix. However, WP needs some proper skills and understanding to create an impressive website. So, if you are about to start spreading your business wings online, Wix would be the best builder to get started with. Suppose you’re not sure how to start your online business store, here is a guide to help you.